The redesigned Phep+® features a rugged and ergonomically enhanced casing that fits comfortably in your hand and a larger LCD which makes it easier to read at any angle. With the latest innovation of a non-clogging fiber junction the new Phep+® meters last much longer. Simply pull out 1-2 mm (1/8") of the junction fiber to completely renew the junction. 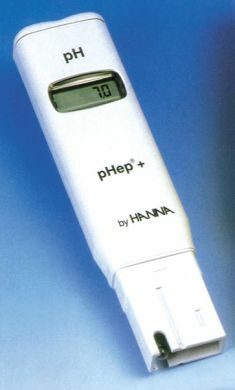 Simply dip the tester into the solution you want to measure, and read the pH to 0.1 resolution on the digital display. An easy to use pocket pH tester with digital readout of pH. This version features automatic temperature compensation which measures the sample temperature and compensates the pH reading accordingly.